Here’s an inspiring story. Fraser Anning, an utterly repugnant far-right Australian senator, who literally blamed the victims of the Christchurch massacre for their own murder, got his just comeuppance. As he was speaking, a White kid hit him over the head with an egg. And the lad is now an internet hero. Will Connolly, the 17 year old boy who egged the far-right Australian senator Fraser Anning, has become an online hero. Australia’s Prime Minister Scott Morrison suggested yesterday that the anti-Muslim senator should be charged after he slapped a teenager who cracked a raw egg over his head. “The real cause of the bloodshed on New Zealand streets today is the immigration programe which allowed Muslim fanatics to migrate to New Zealand in the first place, ” he said later. A GoFundMe page set up to raise A$2,000 (£1,0000) to pay for Connolly’s ‘legal fees’ and ‘more eggs’ had exceeded A$25,000 yesterday. Let’s add a bit more detail to this. Anning didn’t just blame Muslim immigration for the violence, he specifically suggested that the victims of this atrocity were themselves violent and to blame for it. He issued a statement essentially saying that Islam is a violent religion, all Muslims were violent, and the massacre victims were ‘not armed yet’. Very many religions and ideologies, including Christianity, have their violent as well as peaceful aspects, and Islam is no different. At times it has expanded through military conquest and at others through peaceful preaching and simply commercial interaction. It’s believed that Islam spread into sub-Saharan African, for example, through merchants, and that many of the African peoples, who adopted it did so because the majlis, or assembly of religious scholars, offered a constitutional check to the power of the kings. It’s also obviously untrue that Muslims are violent, as clearly shown by the peaceful behaviour of the vast majority. And Anning’s statement about the victims of the massacre is both wrong and obscene. They weren’t armed at all, and there’s no evidence whatsoever that they were going to be. Kevin Logan dealt with this lie in his livestream he did with feminist professor Kristi Winters. It’s on YouTube, entitled ‘We Love You Kiwis’. I haven’t reblogged it, because it’s over an hour long and Logan, as an internet atheist, makes a series of gratuitous attacks on Christianity. But on a more positive note, he did post this video celebrating Anning’s nemesis. Enjoy! Margolis’ article is also interesting for how she describes the attack on Corbyn. She repeats the falsehood that he was hit with an egg – he wasn’t. He was punched in the head. But she admits he was attacked by a racist. Which is interesting, as this is a tacit admission that Corbyn isn’t. And if he isn’t a racist, he can’t be an anti-Semite, by definition. But I doubt you’ll find the I going that far to buck the anti-Semitism witch-hunt against Labour. Boris Johnson’s Car Crash Radio Interview. But Will He Be Ridiculed like Diane Abbott? 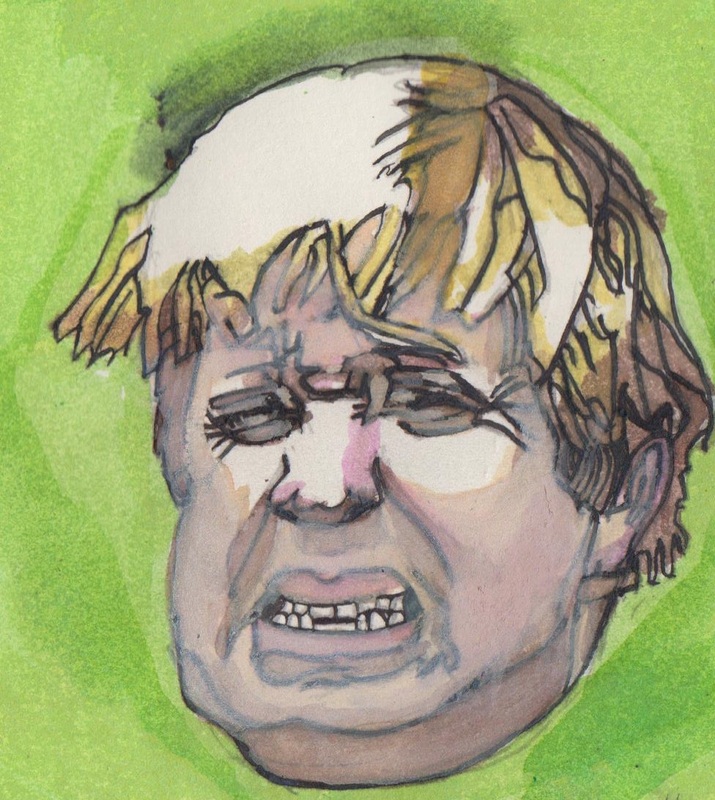 My drawing of Boris Johnson, who seems to have been in some pain. Make up your own jokes. Earlier today, Mike put up an audio clip of Boris Johnson, Tory MP for Henley on Thames, former editor of the Spectator, mayor of London, and frequent guest on Have I Got News For You being interviewed on the Queen’s Speech by Eddie Mair on Radio 4. Boris has got a reputation as an incompetent buffoon, based on the fact that things have gone spectacularly wrong with him in charge in public for years. Like, for example, when he tried coming down a zipline for some event, and got stuck halfway along and had to be rescued. Or when he shut himself out of his own house in front of reporters. Or when he held a press meeting for some campaign he was involved in, only to have the video go wrong, as reported in Private Eye. This interview will most certainly not have dispelled that reputation. Mair begins by asking Johnson about Theresa May’s comments last year about tackling various injustices. What was there in the Queen’s Speech today, about correcting the harsher treatment Blacks receive in court? Johnson’s reply was a series a mumbled ‘ers’, followed by ‘I’ve got it here somewhere’ and rustling sounds. So Mair moved on to his next question, which was about what plans the government may have to tackle mental health issues. More mumbling and sounds of ignorance from Johnson, who then tried to change the subject and go back to the previous question. At which point Mair brought him up sharp with the words, ‘No, Boris, this isn’t the Two Ronnies, where you can answer the question before last’, referring to that sketch which gently sent up Mastermind. He then asked Boris about the contents of the Queen’s Speech in general. BoJo didn’t know, and so Mair told him. Or rather, he listed all the subjects and policies May had said she would tackle in her manifesto, which she has now discarded. 13.7 million people voted for that manifesto, said Mair. Was it right that this should now be thrown away? More mumbling and muttering from Boris, who blustered something about ‘changed circumstances’. Along with the clip, Mike has also put up some of the responses to it on social media, including those of the Labour politicos John Prescott and Chuka Umunna, and the left-wing writer and journo, Owen Jones. All of them make the point that this was a dreadful interview, comparable to that of Diane Abbott a few weeks ago. This resulted in Abbott being ridiculed across the media. Now Boris has given a similarly bad one, so will he get the same treatment? They all make the point that he won’t. In the last week or so, we’ve heard May and her Tories say “Would you want Diane Abbott as Home Secretary”? Such a question is predicated on the knowledge of the Other. The idea that the Home Office will be run not only by a woman, but a black woman is too much to bear for our crypto-racists. Better to have a white woman or a white man in charge, eh? Where are the black faces in May’s cabinet? There are none. There are a couple of Asian millionaires but no black people. Diane Abbott has been attacked precisely because she is black and because she’s a woman. Boris Johnson is allowed to make as many gaffes as he likes and get away with it. He’s given plenty of latitude when he indulges in racism and his thuggish behaviour is regularly overlooked, even laughed off. He’s a clown, so we’re told. When you base your competency argument on a handful of gaffes rather than a person’s record, then you play the bully’s game. If you can’t see the obvious racism that underpins the bullying of Abbott and prefer to focus on her presumed incompetency, then you need to have a word with yourself. Part of the issue in Abbott’s case, I suspect, is the fact that challenging racism has been a very important part of Abbott’s political career. Her parents were both working class. The Daily Mail a little while ago in an article on her claimed that she was personally embittered because she believed that her mother had been passed over for promotion because of her colour. Which is very possible, given the racism of the times. And below Abbot’s was the statement ‘All White people are racist’. This was designed to show how far left and unfit for government the Labour party was. As it stands, Ken Livingstone was in favour of workers’ control, though this was only one aspect of his views on industry and government. And as some of his Tory opponents and colleagues in London admitted, Livingstone was far from a lunatic. I’m sure the same can be said for Abbott. The quotations from the Scum sound plausible, but that’s what effective propaganda has to be. If it sounds like lies, then people won’t believe it. And it isn’t as though the Scum doesn’t have a reputation for lying. As one of the premier organs of Thatcherite propaganda, it shares all the mendacity of the party is loudly supports. And this is quite apart from its blatant racism. Way back at the end of the 1990s or the first years of this century, Private Eye ran an article on yet another case in which the Scum had been hauled up before the Press Complaints Commission, as was, for racism. The Eye pointed out that the wretched paper had had 19 decisions against it by the Commission for racism over the years. And that was then. Who knows what the count is now! As for Abbott, she seems perfectly at home with Michael Portillo and Andrew Neil on The Daily Politics. I did hear a little while ago that Portillo was her baby’s godfather, though I’m not sure if this is right. If it is, it confirms that she’s fitted right in as a politician of long and distinguished standing. Will Boris get pilloried for his dreadful performance? Of course he won’t! He’s White, pukka old Etonian establishment – the type of people, who believe that they have an unquestionable right to govern the rest of us, and who the right-wing media, including the Beeb, will support against challengers like Abbott. Or Jeremy Corbyn, for that matter, who was also ridiculed after failing to know the answer to a question posed by Woman’s Hour. Which will just show just how biased in terms of class and race the Beeb and media are. And for fans of classic comedy, here’s the Two Ronnies Sketch in question. Mike over at Vox Political has put up a piece reporting that Ricky Gervaise, Dr Stephen Hawking and Mark Ruffalo, the actor, who played Dr. Bruce Banner, the alter ego of the Incredible Hulk, have all urged the public to vote Labour on Thursday. Gervaise issued a Tweet stating he wasn’t telling people which way to vote, but it was a fact that the only way to keep the Tories out was to vote for Jeremy Corbyn. Mark Ruffalo stated that he humbly endorsed Jeremy Corbyn, as he offers people an alternative to the corporate status quo, which never ends well for people. This prompted John Prescott to Tweet ‘Hulk smash Tories’. Indeed he would. Banner and the Hulk in the original Marvel comics were profoundly countercultural figures. The Hulk was anger incarnate, born in the radiation blast of an American nuclear test when Banner tried to save teenager Rick. And Rick was very much a ‘rebel without a cause’, a youth, who’d driven into the test zone, heedless of his own safety, because he didn’t feel society had anything for him. While Banner was very much a square, whose girlfriend was the daughter of the commanding officer in charge of the test, the tenor of the strip was very much anti-militarist. The commanding officer hated the Hulk, and had resolved to destroy him. The Hulk, however, really only wanted to be left alone, and so one constant theme was the running battle between the Hulk and the US army. Ang Lee’s film version of the strip, which unfortunately flopped, got this part of the Hulk’s characterisation absolutely right. And in the 1970s, the anti-militarist message of the strip became stronger. In one story, for example, Banner discovered and did his best to oppose dehumanising military experiments to link soldier’s brains to battle robots, experiments that had resulted in the troopers themselves feeling robotic and mechanical. The influence of the Vietnam War in dehumanising a generation of American young men, to turn them into ruthless monsters responsible for horrific atrocities, is shown very clearly here. And one real-life physicist, who has also come out for the Labour party is Cosmologist Dr. Stephen Hawking. Hawking told the Independent and the Mirror that he was voting Labour, because another five years of the Tories would be a disaster for the NHS, the police and other public services. His endorsement has been welcomed by people like Dr. Alex Gates. Hawking is best known for his book, A Brief History of Time, though his background is in Black Holes. Dr Hawking even has a variety of radiation named after him. Black Holes, or rather the Event Horizons around them, are gradually evaporating, and the radiation they give off is called ‘Hawking Radiation’. And so Dr. Gates quipped that Hawking had spotted the Black Hole in the Tories’ NHS budget. One space scientist, who I feel would definitely have supported Jeremy Corbyn over here and Bernie Sanders in his own country, is Dr. Carl Sagan. Older readers of this blog may remember Sagan from his TV blockbuster history of science, Cosmos, and his SF novel, Contact, which was turned into a film with Jodie Foster as the astronomer heroine, who travels through a wormhole to make contact with an alien civilisation. I very definitely don’t share Sagan’s views on religion. He was a religious sceptic and a founding member of CSICOP. But he was also a man of the Left, who hated imperialism and militarism, and supported the burgeoning Green movement. In the 1980s he warned that a nuclear war would result in a devastating global ‘nuclear winter’ of the type created by the asteroid that wiped out the dinosaurs 65 million years ago. It’s since been shown that this wouldn’t actually occur. But Sagan was right to press for nuclear disarmament, and absolutely right to oppose the new Cold War Reagan and Maggie Thatcher were trying to whip up against the Russians. He was also critical of the design of the space shuttle. This was supposed to be the vehicle that would open space up to just about everyone, provided you were fit enough to stand the three Gs of acceleration into orbit. The Challenger disaster put an end to that. Sagan informed the public that the original design for the Shuttle had been for a smaller vehicle, which would have been purely civilian and much safer and more effective. However, the American military had stopped this, because they wanted a larger vehicle to carry their spy satellites. The result was the over-engineered machine, which exploded at least twice, and whose launches had to be cancelled because of engineering problems. Sagan died of prostate cancer in the 1990s. He was a brilliant scientist and visionary, who speculated about life on Mars and Venus, and, like Hawking, was a staunch advocate of the colonisation of space. And he was inspiration to a generation of young people to have an interest in space and science. One of the most obvious examples of this is Dr Brian Cox, who freely acknowledges Sagan’s influence. One feels that Sagan would have firmly resisted everything Bush, Blair, and now Trump, Cameron and May have done to destroy the environment and spread carnage around the world through their wars in the Middle East, quite apart from the Trump’s administration hatred of mainstream science. You don’t have to use Sagan’s ‘spaceship of the imagination’ to travel light years to see the immense harm Theresa May and her party have inflicted on the NHS, the public services and our national security. And you don’t have to be a great scientist to realise that the Tories’ attacks on education – their spending cuts, privatisation of schools, and burdening students with tens of thousands in debts – will stop the country’s young people fulfilling their academic potential, regardless of the bilge they may spout about encouraging the STEM subjects. And I think Hawking has spoken out about the dangers of May’s cuts to science funding and research. The only party that is ready to undo all of this is Labour. So please, vote for Corbyn on June 8th. Human Resources director, Granada Group plc., which appealed against an industrial tribunal to reinstate workers sacked for going on strike after their pay was cut from £140 to £100 a week. Member of the Low Pay Commission on the minimum wage, and the New Deal Taskforce. Executive director, Group 4, criticised for mishandling of child offenders after escapes, bullying, riots and attacks on staff. Advisor to the government’s Youth Justice Board on how young offenders should be handled. Chief executive of British Biotech. This company has been repeatedly censured by the Stock Exchange, particularly when it was revealed that it’s leading drug product didn’t work. Chairman of the government’s Finance Advisory Group to help high-tech companies gain financial investors’ confidence. Non-executive director, British Aerospace, which sells weapons to Turkey, some of which are used against the Kurdish separatists. Chairman of the Independent Television Commission. This revoked the license of the Kurdish satellite station Med TV because of complaints from Turkey that it gave a platform to Kurdish separatists. Non-executive director, Safeway, one of the supermarkets which was swallowing branches of the Post Office. Made chairman of the Post Office. Head of Special Projects division of Tarmac Plc, one of the major constructors of PFI hospitals. Chief Executive of the Department of Health’s Private Finance Unit. In 1998, returned to Tarmac to run PFI division. Corporate Development Director of Serco Group Plc. Chief executive of the government’s Private Finance Panel. Director of the TI Group, which owned Matrix Churchill, the company which provided machine tools to manufacture arms to the Iraqis. He is the company’s chief executive, which is engaged in 150 military operations around the world. Head of the government’s Defence Export Services Organisation, advising the government on granting licenses to companies wishing to sell arms to different countries around the world. Director of PTBRO, the distributor of the government’s landfill tax money, for which it receives 10 per cent of the amount handled in administration fees. Director of Entrust, the regulatory body supervising the distribution of landfill tax money. Company Secretary, BP-Amoco Plc, one of the most controversial mergers of the 1990s as it amalgamated two of the world’s biggest companies. On the board of the Competition Commission, monitoring and regulating corporate mergers. On the board of BT, which has been frequently attacked for having too great a share of the market. On the board of the Competition Commission. Watson Steel, part of AMEC group, won contract to build the masts and cables on the Millennium Dome. Chairman of the government’s Commission for New Towns. Chairman of the government agency English Partnerships, which is supposed to help ensure that new developments meet public needs. On the board of the New Millennium Experience Company, firm set up by government to supervise the millennium celebrations. Property of industry lobby group for property developers, the British Property Federation. Group Chief Executive, AMEC plc. In 1997 the company was the seventh largest recipient of support from the government’s Export Credit Guarantee Department for construction work in Hong Kong. The trade body to which it belonged, The Export Group for the Construction Industries – has lobbied against the inclusion of environmental and human rights conditions in the Export Credit Guarantee Department’s loans. On the Export Guarantees Advisory Council, which governs the payment of government money by the Export Credit Guarantee Department. Liz Airey, a non-executive director of Amec, is another member. Director-General of the Research Councils, which are supposed to fund scientific work that doesn’t have an obvious or immediate application for industry. Chairman of the Atomic Energy Authority Technology Plc, which oversaw the organisational changes at Dounreay. These were criticised by the Health and Safety Executive as leaving the company in a poor position to decommission the site. Some researchers believed that Dounreay was the most dangerous nuclear site in Western Europe. Chairman of the government’s Medical Research Council, which has been repeatedly criticised for failing to provide research funds for investigating the medical effects of radiation. Also member of the government’s panel on sustainable development. Executive director, Zeneca Group Plc. Zeneca’s a major biotechnology firm, and was the foremost developer in Britain of GM crops. The company was engaged in a ten-year deal with the John Innes Centre in Norwich to find profitable applications for biotechnology. Chairman of the Biotechnology and Biological Sciences Research Council, which gives substantial funding to the John Innes Research Institute. Employees of Zeneca sit on all seven of the BBSRC specialist committees. Member of the government’s advisory committee on Business and the Environment. External and Regulatory Affairs Manager of Zeneca Plant Science; sits on five of the taskforces set up by EuropaBio, the lobbying organisation seeking to persuade European governments to deregulate GM organisms. Member of the government’s Advisory Committee on Releases to the Environment. Member of the board of the Bioindustry Association, the lobbying group seeking to ‘enhance the status of the industry within government’. Director of the government’s Scottish Crop Research Institute, charged with supervising government-funded research projects and providing the government with impartial advice on biotechnology. Director General of the British Agrochemicals Association Ltd; Managing director of Schering Agrochemicals/ AgrEvo UK Ltd.
Chairman of the government’s Home Grown Cereals Authority (HGCA), carrying out and funding research into cereal crops. It has not funded any projects aimed at improving organic cereal production. Head of the School of Medicine and Health, University of Central Lancashire. This has received support for its research from three companies producing baby milk. Agett has personally received fees from two companies producing baby milk, including Nestle. The promotion of baby milk to developing nations is one of the most controversial issues in food and nutrition. Chair of the Department of Health’s Committee on the Medical Aspects of Food and Nutrition Policy (COMA). Three other members of COMA have either directly benefited from payments from the baby milk manufacturers or belong to academic departments which have. One of those, who personally received payments was a Nestle executive. Nestlé’s director of research and development. Director of the government’s Institute of Food Research. Chairman of the Channel Tunnel construction consortium, Eurotunnel. This had debts of £9m. Advised John Prescott on financing of Channel Tunnel Rail Link; Chairman of the Strategic Rail Authority responsible for advising the government on the use of significant amounts to the industry, and ensuring that rail transport gives good value for money. If anyone was ever in any doubt as to the Tories’ loathing of democracy, then they need look no further than this latest conference or, indeed, previous conferences. Speaker after speaker mounted the platform to address the conference, all of whom either syruped praise on their leadership or smeared their opponents. Policies are never openly debated or voted upon at Tory Party conferences. The unspoken dictum is, as ever, “we speak and you will listen”. The Conservative Party’s members have little or no say in how their party operates or how policies are decided. It is, for all intents and purposes, a dictatorship. Is it any wonder why Tory governments act to crush democracy in this country when there is so little of it within their own party? This conference also showed us how far into themselves the Tories have retreated since Jeremy Corbyn’s election to the Labour Party leadership, and the hundreds of thousands who have joined the party since his victory. In contrast, the Conservatives are estimated to have less than 100,000 ageing members. So watching the Tory Party conference was, for me at least, a little like witnessing the last days of the Roman Empire. Degenerate and decadent, they can only look inward and indulge themselves in a little mutual masturbation for a bit of comfort. Indeed, it could be said that the security barrier surrounding the conference centre was the physical manifestation of their bunker mentality. This is exactly right, and it’s been well-known for decades. I can remember being told about it by members of the Socialist Society back at College. They were outraged at the way the Tories under Thatcher were making much of the division in the Labour ranks over the Militant Tendency, and contrasting it with the supposed tranquil orderliness of their own party. In fact, the Tory party has never been a democracy, and given its history, this should come as no surprise whatsoever. The Tories started out as the party of the Anglican aristocracy. The Anglican Church has since clashed with the Tories several times on important social issues. I can remember Norman Tebbit’s frothing outrage when the then Archbishop of Canterbury, Robert Runcie, dared criticised St. Maggie of Grantham on her contempt for the poor. However, the aristocratic attitude of patrician leadership over the masses continues. The major decisions are always made in private behind closed doors. The Cat notes that the Tories are now down to a bare 100,000 members – coincidentally – or not – the numbers the Italian Fascist and Nazi party in Germany claimed they would limit the membership of their parties to in order to make them truly elitist. Part of the reason the Tory party has shrunk so massively is that the rank and file members feel that they are being shoved aside and ignored in favour of rich donors and the party leadership. Then there’s the little matter of Cameron’s tirade against Corbyn. Corbyn has stated that he wants a united Ireland. This, apparently, is the basis for Cameron’s denunciation of him as ‘friend of terrorists’. This looks very much like a piece of grossly malicious slander. A lot of people in the Labour party want a united Ireland. One of the reasons for this is that a lot of Labour party members are themselves, or are descended from, working class Irish Roman Catholics. Clare Short was one of these. I can remember an interview with her on Radio 4, in which she talked about her Irish working class roots, and how she had made pilgrimages to the sites deep in the Irish countryside where her descendants were forced to worship secretly when the Roman Catholic church was banned by the British. Short was a very controversial figure, notably for her campaign to ban page 3 of the Sun. She was not, however, to my knowledge a supporter of terrorism. Neither is Corbyn. Cameron here is trying to use one of the major lies Thatcher used against the Labour party in the 1980s. Some sections of the Labour party aroused extreme controversy for supporting Irish Republicans, including talking to Sinn Fein. Thatcher, by contrast, portrayed herself as resolutely defying the terrorists with her usual posturing of Churchillian patriotism. All the time she was declaring her firmness of resolve never to give in Irish Nationalist terrorists, she was in peace negotiations with them. In fact, the Tories had tried to negotiate a peaceful settlement to the Troubles under Ted Heath, but that collapsed due to the obstinate refusals of the Unionists. And when a peaceful settlement was eventually found, the impetus for it was not the shocking violence and loss of life created by terrorist atrocity after terrorist atrocity from the paramilitaries on both sides of religio-political divide. No, it was purely monetary. It was when the IRA bombed Canary Wharf. Suddenly realising that the IRA could wreck the multi-billion pound financial hub of the City of London, Thatcher and Major finally decided to stop pretending military force was the only solution and talk to the Republicans. Let’s get this straight: for all the Tories maudlin rhetoric about the victims of the IRA, what they really cared about, what really frightened them, was the IRA might force the bankers and financiers out of the capital, thus dealing a severe blow to the financial sector that they favour so strongly. Human lives don’t count. Elite money does. As for supporting terrorists, this is another piece of massive hypocrisy. The Cat has already published numerous pieces about the connections between the Ulster Unionist parties and the various Loyalist paramilitary groups in Northern Ireland. Moreover, there is considerable evidence that the British secret state heavily supported the Loyalist paramilitaries, using them to gather intelligence and act as death squads against leading Republicans. As for spitting on and throwing eggs at politicians, the Cat rebutted Hartley-Brewer’s argument by putting up footage of Edward Heath having eggs thrown at him. There was a flurry of it in the 1980s under Thatcher, mostly directed against Keith Joseph. So much so that it became a joke in the spoof Dear Bill diaries published in Private Eye. As for it being only a feature of the Left, well, not quite. Some of us can still remember the incident when John Prescott punched a young Welsh farmer. The lad had thrown an egg at him, and Prescott responded with his fists. A thuggish, but perfectly understandable reaction. So, as the Cat’s article shows, the Tory Conference shows the elitist contempt for democracy, and the revival of the kind of lies and smears used by Thatcher. It’s the politics of desperation, although you could be forgiven for thinking that the opposite was true. The Beeb was practically falling over itself yesterday about how exciting and optimistic it all was. The female newsreader on Points West, the Corporation’s regional news programme for Bristol and Somerset, even went and declared that it was ‘bubbly’. She seemed positively overjoyed. It’s all forced. The fact that Cameron is claiming that Corbyn is a supporter of terrorism, simply because he wants a united Ireland, is proof of that. Behind the smiles is the looming spectre of despair. The Cat’s article is entitled ‘Tory Party 2015 Conference: Some Thoughts’. Go and read it at https://buddyhell.wordpress.com/2015/10/07/tory-party-conference-2015-some-thoughts/ for an effective deconstruction of the Tories’ bile and hypocrisy. According to the article in yesterday’s Welfare Weekly, Opinion: £30 Billion National Insurance Surplus A Kick In The Teeth For Starving Families. John Prescott writing in the Daily Mirror revealed that George Osborne had held back about £30 billion in National Insurance contributions from the NHS or the benefits system. The article states that money from NI contributions can only be spent in these areas. It cannot be spent anywhere else. The former deputy Prime Minister recommends that it should be spent on the NHS. The article in Welfare Weekly suggests that it should also be spent on benefits for people forced to rely on food banks due to delays in processing their claims, or sanctions. Welfare Weekly’s article can be read here at http://www.welfareweekly.com/opinion-30-billion-national-insurance-surplus-kick-teeth-starving-families/. One question the article does not address, which is extremely pertinent is: Why was this money not spent? Clearly, the existence of such funds gives the lie to the Tories’ claim that the funding is simply not there. Nor can they reasonably claim that they are using the money to pay off the deficit. And please see the many pieces by the Angry Yorkshireman over at Another Angry Voice, Mike on Vox Political, Alittleecon, to name but a few, who can explain why this part of the government’s aims is voodoo economics anyway. The real reason for withholding the money, it seems to me, is simply for the government to force more people into poverty, destitution and despair. A starving populace is a compliant populace, which they feel will accept any treatment they and the big businesses they represent care to mete out. The Tories’ View of the Rest of Britain: Bantustans to Serve the London Rich? Norman Tebbit was in the news again last week. Thatcher’s no. 1 cabinet enforcer was angry that people in the provinces were having the audacity to criticise the government’s almost exclusive concentration on the metropolis, leaving the rest of the country, and particularly the north, to languish and die. A few years ago Private Eye likened Tebbit to a pre-human fossil, Boxgrove Man, that had recently been discovered, and hailed as Britain’s oldest man. The Eye showed a picture of a skull of Heidelberg Man, the type of human that gave rise to the Neanderthals in Europe, the Caucasus and Israel, and modern humans, Homo Sapiens Sapiens, us, in Africa. The Eye’s satirical headline asked ‘Is this the World’s Oldest Tory?’ It then went on to state that although Chingford Man had a very small brain, it was still capable of getting on a bike and looking for work. It’s an appropriate comment, as Tebbit doesn’t seem to have changed his views on the unemployed since the 1980s, when he advised them to follow his father’s example and ‘get on (their) bike(s) and look for work’. Criticism of the Tories’ favouring of London was simply envy, declared the cadaverous one. Rather than be jealous of the metropolis and its success, people in the rest of the country should support themselves by coming down and working in the capital for two days. There’s a section of the Tory party that has always favoured leaving Britain’s declining towns to wither and die. A little while ago cabinet documents from Thatcher’s time were released, in which senior Conservatives advised the Leaderene to let Liverpool die, and deprive it of any government help to recover. The other year the art critic and broadcaster, Brian Sewell, interviewed on the subject of class by John Prescott, expressed similar sentiments about the ‘dreadful mill towns in the north’ which should all be demolished. Tebbit’s comments are, of course, petty, spiteful and unrealistic. People have a perfect right to criticise the Tories’ promotion of the capital and the way it harms their own communities. His idea that you could somehow make enough money to support yourself by working in the capital for a couple of days each week is simply unrealistic. Transport and accommodation costs would simply eat up any money most people had made working there. If they were able to find suitable work in the first place. It’s all rather reminiscent of the time the Tories told people in mid-Wales that they shouldn’t worry about unemployment in their town, as they could get on a bus and be in Cardiff in an hour. This blithely ignored the fact that, thanks to Tory cuts, there were no buses running to Brecon. Furthermore, there were already people from that area forced to work in Cardiff, who already found the journey difficult and barely economic. Added to which was the fact that it was also difficult to find work there. Tebbit had learned nothing from this. I doubt he was even aware of it, and so was able to make his ignorant comments without any awareness of how daft they were. It does, however, also show how a kind of economic apartheid is emerging in Britain under the Tories. The protestors against the ‘poor doors’ in London, segregated entrances to keep working and lower middle class people apart from the super-rich in their luxury apartments, have noted that this is a kind of apartheid, and drawn parallels with South Africa and its segregation of White and Black. Under apartheid, much of the poor Black population was forced to work away from their homelands as well. There was little or no work available in the Bantustans, the tribal homelands established to confine and isolate the Black peoples from the White population. This was deliberate, and the best land with the greatest resources had been reserved for the Whites. Young men from different tribes were therefore forced to live away from their homes and families in order to find work. And this, it seems, is the Tory vision for Britain. The poor are to be kept isolated, away from the rich, in poorly served areas, with high unemployment and few resources and opportunities. They will, however, make some kind of meagre living coming to work for their social superiors in the metropolis, on which the Tories will concentrate their resources and policies in order to provide a luxuriously high standard of living for the super-rich, who settled there. No doubt these new, migrant workers will be forced to live in shanty towns just outside the gentrified districts.